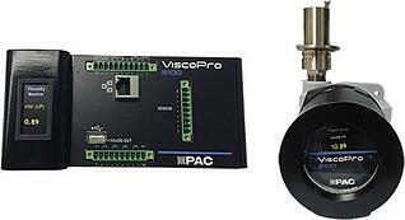 The PAC ViscoPro 2100 is the next generation viscometer for the process industries. By incorporating the oscillating piston method, which is an industry-proven sensor technology, the ViscoPro 2100 Online Viscosity Monitoring System is the best choice for applications requiring fast, real-time analysis with reliable data that correlates tightly with laboratory results. Cambridge Viscosity is the global leader in small sample fluid viscosity measurement. For more than a quarter century we have served the oil and gas; paint, ink and coating; pharmaceutical and chemical industries with highly accurate and exceptionally reliable in-process and laboratory viscometers. Our unique advantages derive from the proprietary oscillating piston technology we have developed. This core technology enables our instruments to measure fluid viscosity with precision and keep the measurement chamber clean; all the while requiring a very small amount of fluid. Small sample viscosity is essential in applications where the value of the fluid is high and only small amounts are available such as PVT analysis for exploration or refrigeration; optical and biomedical coating control; and lubrication oil analysis. It is equally critical in large fluid processes such as refining and chemicals where in-process and laboratory measurements must exactly correspond. In these large stream cases, conditioning in-process fluid is important so that lab-matching accurate and repeatable measurements can be made, and conditioning as small a process stream as possible is economically preferable. Further, small sample viscosity requires small sensors, which are easy to install in a wide variety of process locations. Our instruments are widely used wherever accurate fluid viscosity measurements are required. Cambridge sensors are physically small and robust so that they can be installed easily in many difficult process environments including hazardous locations and even on-engines and compressors. Our customers select Cambridge Viscosity laboratory and process viscometers time and time again. Measuring viscosity under extreme pressure and temperature is a challenge! Special equipment and techniques are needed. Download our free PVT Whitepaper and learn more. Viscosity and density of in-process asphalt can vary significantly during processing. What you need is a way to measure viscosity and density -- In real time! Get our free whitepaper and learn how.